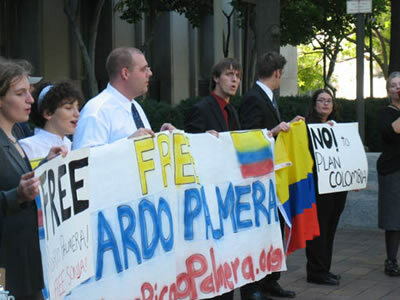 Colombian Revolutionary on Trial:	Palmera Stands Tall in D.C. Court | Fight Back! 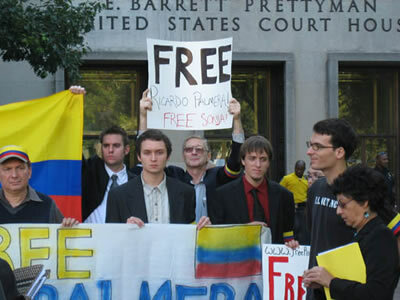 Washington DC - Smiling at supporters with his fist in the air, Ricardo Palmera, a leading Colombian rebel was led from the courtroom by guards Oct. 12. Palmera, a negotiator and spokesperson for the Revolutionary Armed Forces of Colombia (FARC) was kidnapped and brought to the United States. He is now on trial in Federal Court. The Latin American press extensively covered the picket line and press conference held outside the courthouse. News of the protest was covered live on Colombian radio stations and in advance by the country’s main news magazine. Coverage of the protest was carried in the Cuban press and on Venezuelan TV. After the press conference, Palmera supporters went to the fourth floor of the Federal Courthouse where the trial was scheduled to take place. Court officials claimed the courtroom was empty and nothing would occur there. After going through an additional security check, protesters entered the courtroom, where the trial was in the jury selection phase. Presiding Judge Hogan made it clear that he was aware of the protest that had taken place earlier that morning. During his court appearance that day, Palmera was wearing a suit, was not manacled and apparently had the proceedings translated. In previous appearances, Palmera was brought to court in an orange jumpsuit and had to struggle with a Spanish-English dictionary, while wearing handcuffs, to follow the proceedings.